FeastHome – The kitchen is one of the important areas in a house, especially for you who love to cook. There are a lot of kitchen styles that you can apply in your house, one of them is a contemporary kitchen style. A kitchen with a contemporary style is suitable for you who is a lover of classy style. 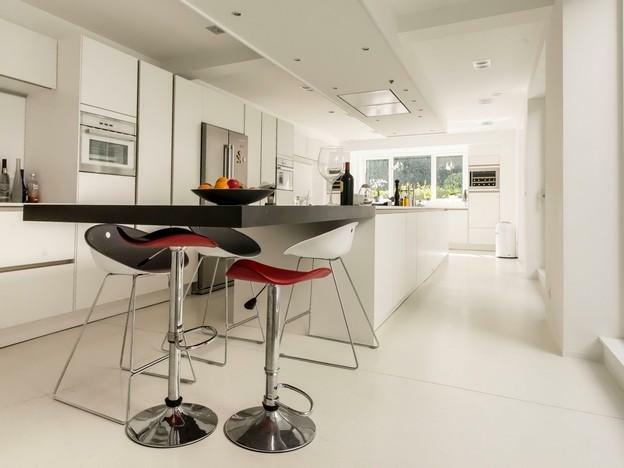 Are you looking for an inspiration of a contemporary style kitchen? Here are some ideas. 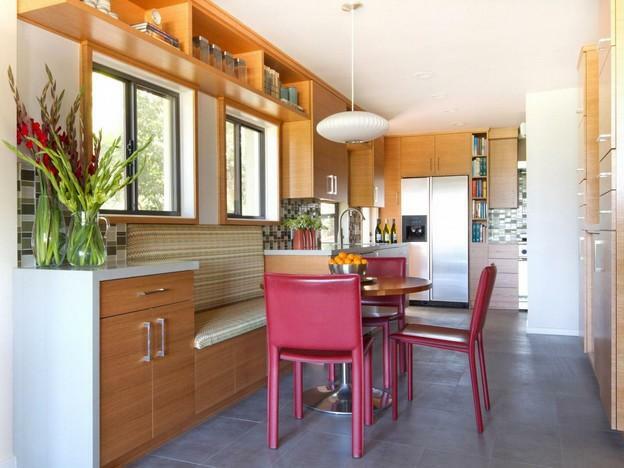 This kitchen looks so brightly simple because of the use of highlight lamps. 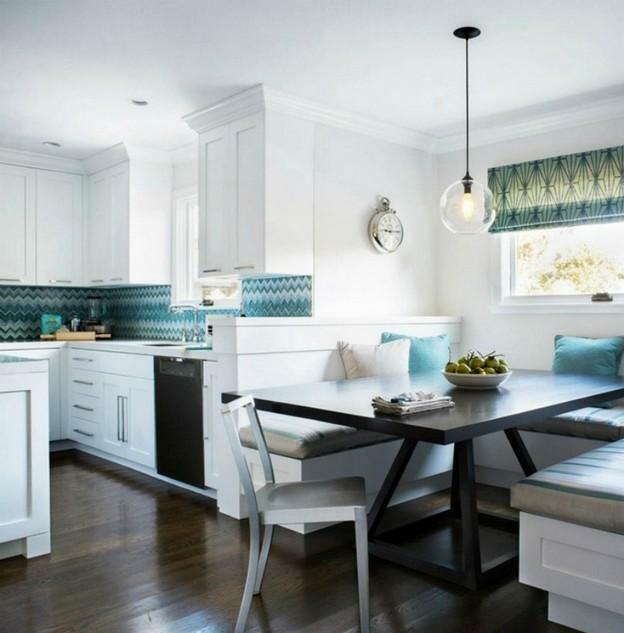 The plaid kitchen wall is used in order to bring a touch of pattern in the area so that it looks less boring. 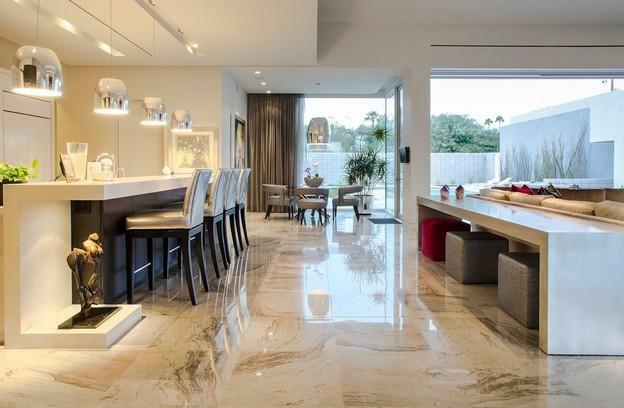 The kitchen area and dining area are in the same place in order to accentuate a practicality. The bar table and bar chairs used as the dining table and dining chairs make this kitchen has a little bit touch of a modern look. The householders divide the kitchen area and dining area by using a wooden floor for the dining area and marble tile for the kitchen area. It is a smart idea if you do not want to use other dividers such as shelf. www.nytexas.comThe combination of white and blue in this kitchen makes it looks so calm. Moreover, the white color that dominates this area makes it looks so bright. The comfortable sofas create a comfortable area for a breakfast. Especially with the glass window that allows the sunlight to come into the area. It completes a perfect atmosphere for having breakfast. And the hanging lamp, it will create a romantic atmosphere for a dinner. The wooden floor brings a warm and natural touch to this kitchen. And the patterned kitchen wall makes it looks less boring. hoerkultur.infoThe color of green, white and natural wood blend so well in this kitchen. Actually, the olive kitchen walls bring a beautiful twist to this area. The wall decoration, classic hanging lamp, and French windows make the classy contemporary style in this kitchen even stronger. The householders add the curtains in order to create a privacy when they are having a breakfast or dinner with the other family members. The curtains are also able to reduce heat from the sunlight when the sun is too bright. 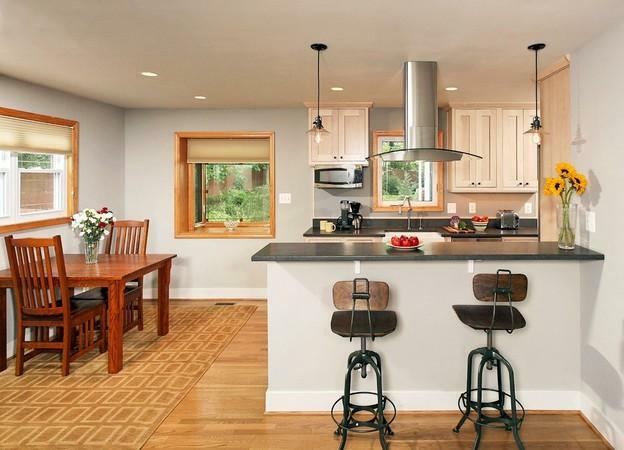 www.forkstroop3.orgThis kitchen looks so warm and natural because the wood material dominates this area. As you can see, the wood material is used for the floor, dining table, dining chairs, windows frames, and also kitchen cabinets. The light tone of the wood also makes this kitchen looks bright even though the householders use only several hidden lamps and 2 hanging lamps. There are 2 areas of dining in this kitchen, the dining area on the left side is perfect for having a breakfast because it is placed near the window. And the one on the right side is suitable for a romantic dinner with those 2 unique dining chairs and classic hanging lamps. hgtv.comThe wood material is used for the kitchen cabinets in this kitchen, which is quite a lot. 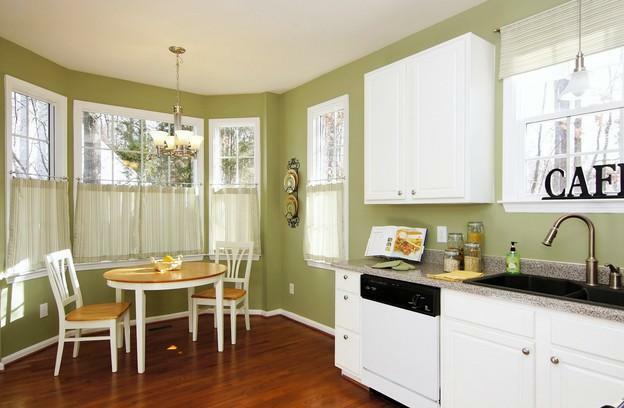 There are many cabinets from the kitchen area until the dining area. And the kitchen cabinets are not only used to store the kitchen utensils and kitchen ingredients, but also the cookbooks. It is very practical so that the householders do not have to go to the reading area to read the cookbook. The sofa creates a comfortable seat and the maroon dining chairs add color to this area. Look at the unique hanging lamp, it adds style to this area. 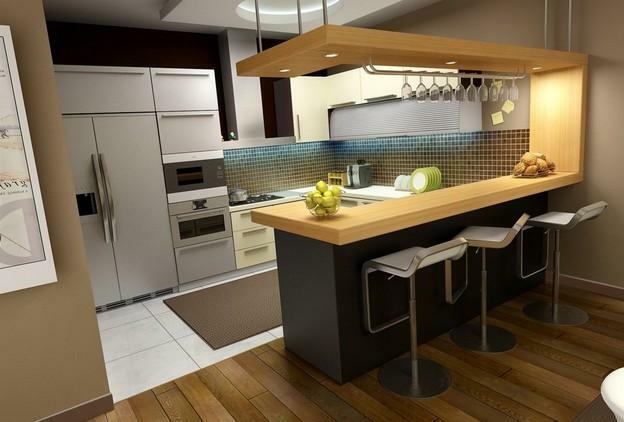 home-designing.comThis kitchen looks very modern because of the modern elements used in this area. Such as the dining chairs and the stainless steel fridge. The white color that dominates this kitchen makes the area looks so simple, bright, and modern. The black and red dining chairs add colors to this area and make it looks less boring. Even though it is very simple, this kitchen is able to be a center of attention in a house. 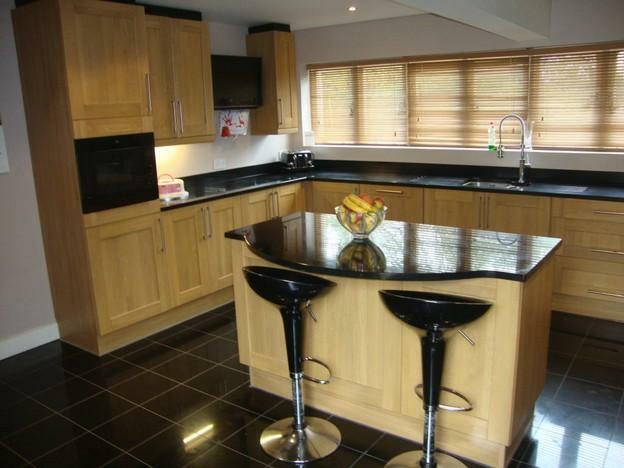 myfancyhouse.comLooking at this kitchen makes us remember about a five stars restaurant. Look at the shining marble floor, big windows, modern hanging lamps, and a large curtain. All the elements used in this kitchen are all fancy. The giant glass windows allow the sunlight to come into the area and reflect the marble floor, making this area even more spacious. The big curtain can be used if the sun is too bright. The hanging lamps can bring a romantic atmosphere for a dinner. This kitchen idea is suitable for you who own a big house and love to have a meal with your big family. www.pointgreypictures.comThis idea is perfect for you who want to have a breakfast with privacy. This area is placed in a small corner. But the glass window will allow the fresh air and natural sunlight come into the area so that it will not be suffocating. 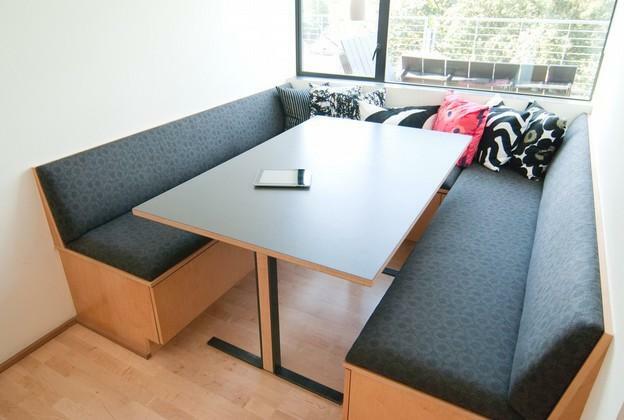 The comfortable sofa and patterned sofa pillows create a comfortable private area for having a meal. And the patterned sofa pillows make this area looks less plain. grandriverbar.comThe combination of light brown tone from the wood material and black marble countertops make this kitchen looks very elegant. The only 2 colors combination, which is light brown and black brings simplicity in this area. 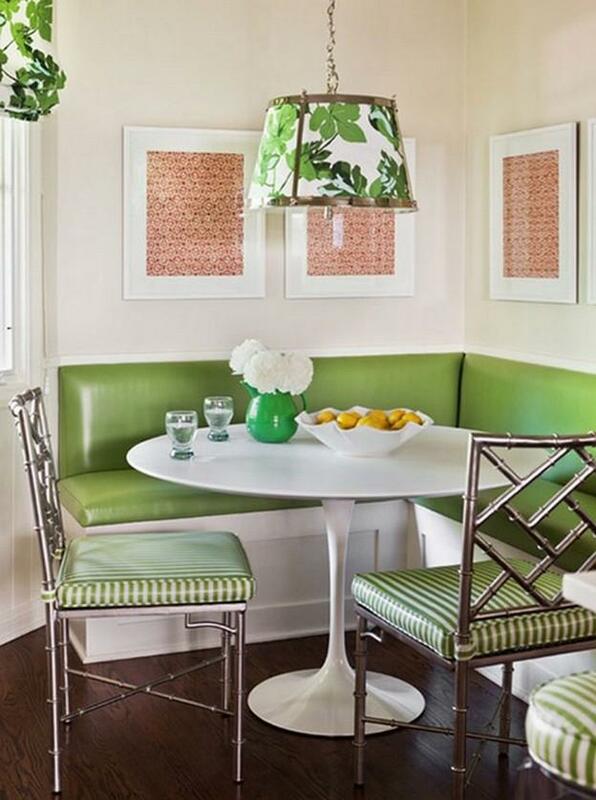 The bar chairs used as the dining chairs add a modern touch. And the dining area is placed in the middle in order to accentuate a practicality. The wooden curtain is able to be used when the sun is shining too brightly. taneymo.usThis contemporary kitchen idea is suitable for you who is a nature lover. The green color makes this area looks so fresh. The householders maintain the theme by using the leaves patterned hanging lamp. And in order to add a color, the red wall decorations are used. Those are the inspirations of the contemporary breakfast kitchen you can follow.